^ Mackay, Æneas (1892). "James V of Scots" . In Lee, Sidney. Dictionary of National Biography. 29. London: Smith, Elder & Co. pp. 153–161. ^ Knox, John, "from History of the Reformation, book 2,". Archived from the original on 2009-08-29. The immediate ancestor to the groat was the French gros tournois or groat of Tours, which was known as the groot in the Netherlands. The name groat refers to a range of other European coins such as those of the Italian peninsula known as a grosso including the grosso of Venice, marco Polo referred to the groat in recounts of his travels to East Asia when describing the currencies of the Yuan Empire. 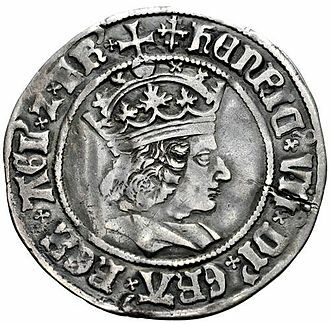 His descriptions were based on the conversion of 1 bezant =20 groats = 133⅓ tornesel and it was after the French silver coin had circulated in England that an English groat was first minted under King Edward I. Scots groats were not issued until the reign of David II, scots groats were originally worth fourpence, but issues were valued at eightpence and a shilling. Irish groats were minted first in 1425 and the last ones were minted under the reign of Elizabeth I of England, there were two more issues, both emergency coinage. The weight was reduced to 72 grains under Edward III,60 grains under Henry IV, from 1544 to 1560 the silver fineness was less than sterling, and after the 1561 issue they were not generally issued for circulation again for about a hundred years. From the reigns of Charles II to George III, groats were issued on a basis for general circulation, the only years of mintage after 1786 being in 1792,1795. After this the only circulating issues were from 1836 to 1855, with proofs known from 1857 and 1862 and these last coins had the weight further reduced to about 27 grains and were the same diameter as the silver threepenny pieces of the day although thicker. Some groats continued to circulate in Scotland until the 20th century, at times in the past, silver twopenny coins have been called half-groats. The groat ceased to be minted in the United Kingdom in 1856, but in 1888 a special request was made for a variety to be minted for use in British Guiana. The groat remained in circulation in British Guiana right up until that territory adopted the system in 1955. In the 1600s and 1700s, chaplains were employed in English Navy ships of war by the Captain, the Navys wages did not rise between 1653 and 1797, during which time the Ordinary Seaman was paid 19 shillings, as was the chaplain. Leith /ˈliːθ/, Scottish Gaelic, Lìte, is a district to the north of the city of Edinburgh at the mouth of the Water of Leith. The earliest surviving references are in the royal charter authorising the construction of Holyrood Abbey in 1128. The medieval settlements of Leith had grown into a burgh by 1833, historically part of Midlothian, Leith is sited on the coast of the Firth of Forth and lies within the council area of the City of Edinburgh. The port remains one of its most valuable enterprises, handling over 1.5 million tonnes of cargo a year in 2003, previous to the bridge being built in the late 15th century, Leith had settlements on either side of the river, lacking an easy crossing. South Leith was larger and was controlled by the lairds of Restalrig and it was based on trade and had many merchants houses and warehouses. This was where ships offloaded their cargoes at The Shore where they were collected by Edinburgh merchants, leithers were explicitly forbidden by statute to participate directly in the trade at the port, to ensure that landed goods were not sold elsewhere. North Leith was smaller but proportionately richer, coming under the jurisdiction of Holyrood Abbey and it was effectively a fishing village consisting of one street, now Sandport Street and Quayside Lane. Burgage plots ran down to the river from each house and this has traditionally been the shipbuilding side of Leith with several wet and dry docks built over time. The first dry dock in Scotland was built here in 1720, a small peninsula of land on the east bank came under the same jurisdiction on what is now Sheriff Brae/Sheriff Bank. The first bridge to both banks of the river was built in 1493 by Abbot Bellenden, who controlled the church at North Leith. 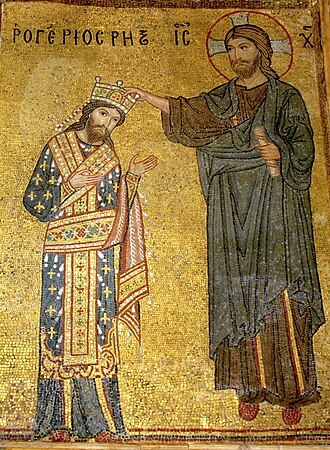 The bridge was a bridge, the revenue supplementing the churchs income. Reputedly Leiths oldest building, it was demolished in 1780 to allow ships to sail further upstream, the earliest evidence of settlement in Leith comes from several archaeological digs undertaken in the Shore area in the late 20th century. Amongst the finds were medieval wharf edges from the 12th century and this date fits with the earliest documentary evidence of settlement in Leith - the foundation charter of Holyrood Abbey. Not to be confused with Hutton Castle in the Scottish Borders Sheriff Hutton Castle is a quadrangular castle in the village of Sheriff Hutton, North Yorkshire, England. In 1377, John Nevill obtained a charter for a market on Monday, a licence to crenellate was granted by Richard II in 1382, although it is unknown whether building work had commenced before this date. The building has been credited to John Llewyn, who built nearby Bolton Castle in 1378, on stylistic. The castle passed to Johns son, Ralph Neville, the first Earl of Westmorland, upon Ralphs death in 1425, the Neville estates were partitioned. 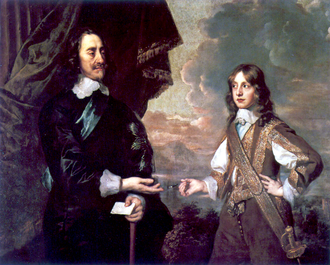 The younger Ralph retained the title and the Durham estates and Richard Neville, Earl of Warwick, known as Warwick the Kingmaker, inherited the Yorkshire estates, including Sheriff Hutton. Upon the death of Richard Neville in 1471 at the Battle of Barnet, his lands were given to Richard, Richard often stayed at the castle during his tenure as Lord of the North. Its proximity to York made it convenient to Richard, northumberland wrote to the magistrates of York ordering them to prepare an armed force. The men of York sent an alderman to Richard at Sheriff Hutton seeking his advice, in 1484, Richard established a royal household for the young Edward, Earl of Warwick, son of George of Clarence, and John, Earl of Lincoln. In July 1484, Richard established the Council of the North, with its headquarters at Sheriff Hutton. The Council lasted for a century and a half, the castle became the property of Henry VII and, in 1525, Henry VIII granted it to his son, Henry Fitzroy, who had been newly created as Duke of Richmond and Warden-General of the Marches. A survey of this describes the castle as being in need of repair. 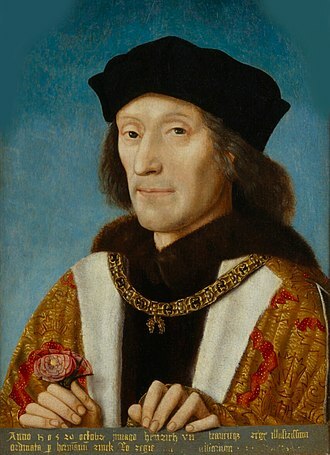 In 1537 Thomas Howard, the second Duke of Norfolk made repairs to the castle but, following the Councils relocation to York in the mid sixteenth century, a further campaign of repairs was undertaken by Henry, Earl of Huntingdon in 1572. The Earl hoped the President of the Council would use the castle as a residence, in 1618 it was again described as ruinous. The castle was acquired by the Ingram family in 1622, the castle remained in the Ingram family until the early twentieth century, by which time the ruins were being used as a farmyard. The ruins of Linlithgow Palace are situated in the town of Linlithgow, West Lothian, Scotland,15 miles west of Edinburgh. The palace was one of the residences of the monarchs of Scotland in the 15th and 16th centuries. Although maintained after Scotlands monarchs left for England in 1603, the palace was little used and it is now a visitor attraction in the care of Historic Scotland. A royal manor existed on the site in the 12th century and this was replaced by a fortification known as the Peel, built in the 14th century by occupying English forces under Edward I. 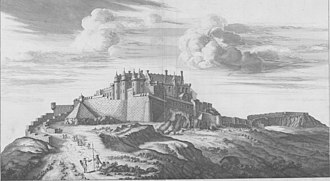 The site of the manor made it a military base for securing the supply routes between Edinburgh Castle and Stirling Castle. The English fort was begun in March 1302 under the supervision of two priests, Richard de Wynepol and Henry de Graundeston, the architect Master James of St George was present. In September 1302, sixty men and 140 women helped dig the ditches, the men were paid twopence, a hundred foot-soldiers were still employed as labourers on the castle in November and work continued during the Summer of 1303. In 1424, the town of Linlithgow was partially destroyed in a great fire, over the following century the palace developed into a formal courtyard structure, with significant additions by James III and James IV. James V, who was born in the palace in April 1512, added the outer gateway, the stonework of the South façade was renewed and unified for James V in the 1530s by the keeper, James Hamilton of Finnart. 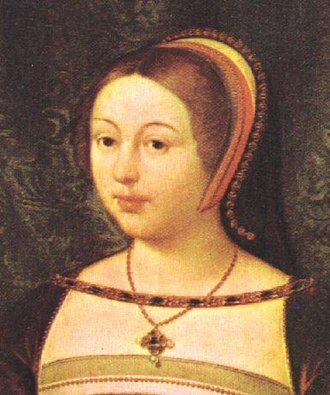 Mary, Queen of Scots, was born at the Palace in December 1542, the daughter of James VI, Elizabeth of Bohemia, lived in the Palace. After the Union of the Crowns in 1603 the Royal Court became largely based in England, King James had it rebuilt between 1618 and 1622. The carving was designed by the mason William Wallace, in July 1620, the architect James Murray of Kilbaberton, estimated that 3000 stones in weight of lead would be needed to cover the roof, costing £3600 in Scottish money. On 5 July 1621 the Earl of Mar wrote to James to tell him he had met Murray and he said the Palace would be ready for the king at Michaelmas. Duke of Rothesay is a title of the heir apparent to the British throne, currently Prince Charles. The Duke of Rothesay holds other Scottish titles, including those of Earl of Carrick, Baron of Renfrew, Lord of the Isles and Prince and Great Steward of Scotland. The title is named after Rothesay on the Isle of Bute and Bute, david Stewart, Duke of Rothesay, the son of Robert III of Scotland, King of Scots, first held the dukedom from its creation in 1398. 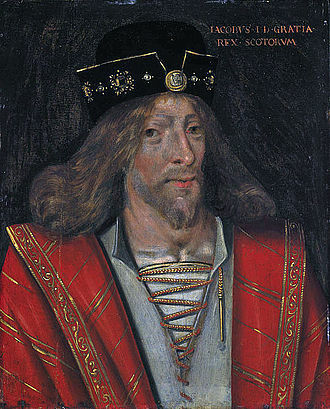 After his death, his brother James, King James I, the heir-apparent to the Scottish Crown held the dukedom, an Act of the Scottish Parliament passed in 1469 confirmed this pattern of succession. The Earldom of Carrick existed as early as the twelfth century, in 1306, Robert the Bruce, Earl of Carrick, became King Robert I of Scotland, with the earldom merging in the Crown. In the following years, successive Kings of Scots created several heirs-apparent Earl of Carrick, the Act of 1469 finally settled the earldom on the eldest son of the Scottish monarch. The office of the Great Steward of Scotland dates back to its first holder, Walter fitz Alan, the seventh Great Steward, ascended the Scots throne as Robert II in 1371. Thereafter, only the heirs-apparent to the Crown held the office, the 1469 Act deals with this. Between the 1603 Union and Edward VIIs time as heir apparent and it was Queen Victoria who mandated the title for use to refer to the eldest son and heir apparent when in Scotland, and this usage has continued since. This may have been as a result, direct or indirect, another of the non-peerage titles belonging to the heir-apparent, that of Lord of the Isles, merits special mention. The Lords of the Isles, of the MacDonald family, originally functioned as vassals of the Scottish — or Norwegian — kings who ruled the Western Isles. 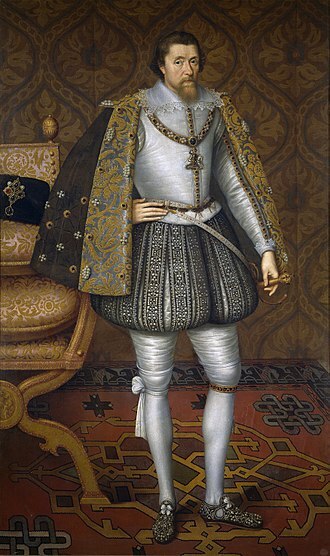 The ambitious John MacDonald II, fourth Lord of the Isles, made a treaty in 1462 with King Edward IV of England. 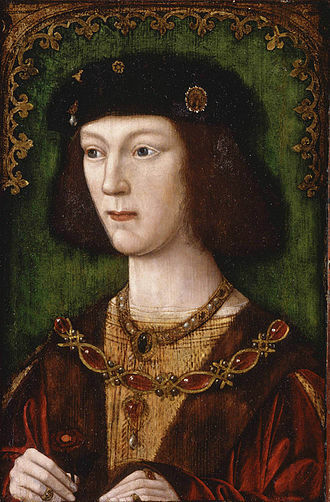 In 1475, James III discovered the Lord of the Isles actions, MacDonald regained his position, but James IV again deprived him of his titles in 1493 after his nephew provoked a rebellion. Tantallon Castle is a semi-ruined mid-14th-century fortress, located 5 kilometres east of North Berwick, in East Lothian, Scotland. It sits atop a promontory opposite the Bass Rock, looking out onto the Firth of Forth, the last medieval curtain wall castle to be constructed in Scotland, Tantallon comprises a single wall blocking off the headland, with the other three sides naturally protected by sea cliffs. Tantallon was built in the mid 14th century by William Douglas and it was passed to his illegitimate son, George Douglas, created Earl of Angus, and despite several sieges, it remained the property of his descendants for much of its history. It was besieged by King James IV in 1491, and again by his successor James V in 1528, Tantallon saw action in the First Bishops War in 1639, and again during Oliver Cromwells invasion of Scotland in 1651, when it was once more severely damaged. It was sold by the Marquis of Douglas in 1699 to Hew Dalrymple, Lord North Berwick, Tantallon is of a singular construction within Scotland, the defences comprising only a single large wall securing a coastal promontory. The south-east, north-east, and north-west approaches are naturally defended by sea cliffs. To the south-west, a curtain wall blocks off the end of the promontory. The curtain wall is built of the red sandstone, and has a tower at either end. A north range of buildings, containing a hall, completed the part of the castle. In total, the buildings of the castle provided around 1,100 square metres of accommodation, in its form, Tantallon follows on from the 12th-century castles of Bothwell and Kildrummy, as a castle of enceinte, or curtain wall castle. It was the last of this type to be built in Scotland, for example, Threave Castle, built at around the same time by Earl Williams cousin Archibald the Grim, is a much more modest tower. 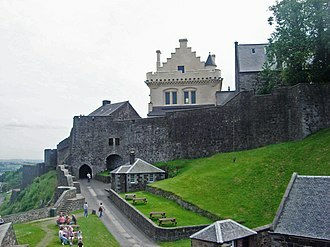 There are similarities between Tantallon and courtyard castles, such as Doune, which dates from the late 14th century. The curtain wall is over 15 metres high,3.6 metres thick, there are several small chambers within the walls, and stairs with arched ceilings accessing the parapet walk. The Palace of Holyroodhouse, commonly referred to as Holyrood Palace, is the official residence of the British monarch in Scotland. Queen Elizabeth spends one week in residence at Holyrood Palace at the beginning of each summer, Sir William Bruce designed the 3-storey plus attic Baroque palace for Charles II upon the restoration of the monarchy. The entry gateway is framed by massive coupled Roman Doric columns, with the carved Royal Arms of Scotland, the north and south fronts have symmetrical 3-storey facades that rise behind to far left and right of 2-storey range with regular arrangement of bays. The east front has 17 pilastered bays with superimposed columns at each floor, the ruins of the abbey church connect to the palace on the north-east corner. Architectural historian Dan Cruickshank selected the palace as one of his eight choices for the 2002 BBC book The Story of Britains Best Buildings, the rooms open to the public include the 17th-century former Kings apartments and Great Gallery, and the 16th-century apartments in the north-west tower. The Great Stair in the south-west corner of the quadrangle has a 17th-century Baroque ceiling featuring plaster angels holding the Honours of Scotland, the Italian paintings on the walls are fragments of frescoes painted circa 1550 by Lattanzio Gambara, illustrating scenes from Ovids Metamorphoses. They were bought by Prince Albert in 1856, and placed here in 1881, at the top of the stair is the Royal Dining Room, formerly part of the Queens apartments. The Adam style decoration dates from around 1800, when this was part of the Duke of Hamiltons apartment, the Kings apartments occupied the whole of the south and east sides of the quadrangle. Accessed from the Great Stair, the suite of rooms comprising a hall, presence chamber, privy chamber, bedchamber. The level of privacy, as well as the richness of decoration, from the visit of George IV in 1822, the guard hall has been used as a throne room, and the order of rooms reversed. The Evening Drawing Room and Morning Drawing Room occupy the former presence chamber and privy chamber, the Morning Drawing Room is hung with French tapestries bought by Charles II, and is used for private ceremonies. The Kings Antechamber and Closet are laid out along the east side of the palace, the Kings Bedchamber, at the centre of the east façade, has the finest of the 17th-century plaster ceilings, augmented by paintings of Hercules by Jacob de Wet II. The 17th-century bed was made for the Duke of Hamilton, although it was referred to as Queen Marys Bed when it occupied the older Queens rooms. The Great Gallery, the largest room in the palace, links the Kings Closet with the former Queens apartments in the west range, the gallery is decorated with 110 portraits of the Scottish monarchs, beginning with the legendary Fergus I, who supposedly ruled from 330 BC. The portraits were all completed between 1684 and 1686 by Jacob de Wet II and this collection celebrated the royal bloodline of Scotland which the Scots upheld for its continuity and antiquity as an important part of their national identity in the seventeenth century. After 1707, Scotlands representative peers were elected here to be sent to Westminster, bonnie Prince Charlie held evening balls in the gallery during his brief occupation, and it became a Catholic chapel for the Comte dArtois. The south side of the High Street was spared the demolition inflicted upon the north side in the 1960s. The eastern end of Linlithgow Loch from the Peel. James IV captured Ford Castle from Lady Heron. 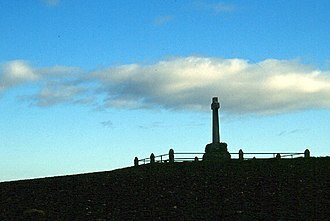 Western side of the battlefield, looking south-south-east from the monument erected in 1910. The Scottish army advanced down the ploughed field, the English down the grassy field in the foreground, and they met, presumably at the valley boundary between the two fields. English bill, reputed to have been used at Flodden. Scott's Monument as it appeared when nearly finished, in October 1844.